As we get into the health insurance renewal season, there are some smaller, non-ACA mandated businesses (less than 50 FTEs) that may consider dropping their small group health plan all together. An average of 20-30% group rate hikes year after year do take a toll on the bottom line, so it would not be surprising. In lieu of carrying a group health plan, some employers may even decide to simply reimburse their employees a set amount for them to obtain individual coverage, or maybe even pay for the employees individual health insurance costs directly. 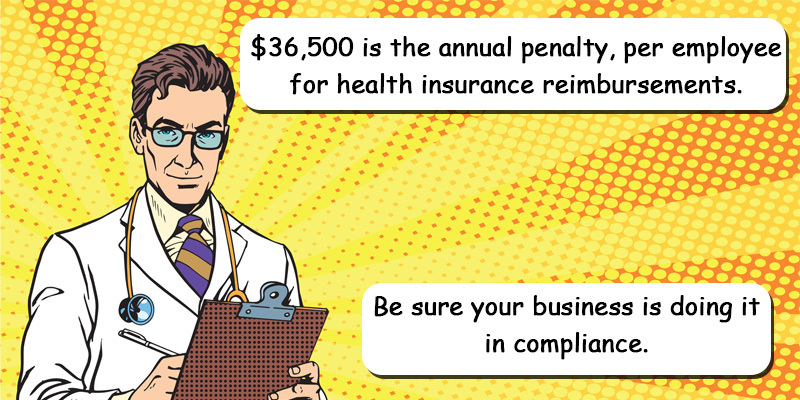 Unfortunately, 2013 guidance from the IRS (Notice 2013-54) ruled that this practice violates the provisions of the ACA regardless of whether the payment to the employee was taxable or not. A violation would subject the employer to an excise tax (aka penalty) of $100 per day, per employee ($36,500 per year), so this could be a very costly mistake. With just three employees, a health insurance reimbursement would lead to an excise tax to the employer of over $100,000. Wow! Good news is that back in 2016, President Obama signed the 21st Century Cures Act into law which allows small employers that do not offer any group health plan to their employees, to adopt a Qualified Small Employer Health Reimbursement Arrangement (QESHRA). This arrangement allows the employer to reimburse employees for premiums they pay for individual insurance policies. This law became effective on January 1st, 2017, so it is relatively new and unknown. With the QESHRA, you can choose a monthly reimbursement of tax-free money to offer each employee. There is a limit as to what can reimbursed, and for 2019 it is $5,150 for individual plans ($429.17 per month) and $10,450 for family plans ($870.83 per month). All full-time employees must be offered the same amount, although different amounts can be based on family status. There are a few other requirements, such as written notice to the employees about the availability of the plan. Starting a QESHRA is very simple and it starts with a plan document and summary plan description (SPD). As of current, there is no filing requirement at inception or on-going with the IRS. PayMaster can provide you with the required document setup for just $199. Contact us, or use this link for online ordering.